Rereading Robin’s recent reviews of carnation fragrances, I was inspired finally to open the bar of Roger & Gallet Carnation soap that has been resting on my bathroom shelf for a while. Carnation is one of my favorite notes in perfumes, second only to rose, and I have just started to explore carnation-scented body products to accompany some of my fragrances. The Roger & Gallet website is full of information about the company and its products, including a history of the company (which dates back to the Napoleonic era) and a lively feature on its perfumed soaps. In 1879, Roger & Gallet released a lavender-scented soap in an innovative round shape: until then, they claim, commercial soaps had only been produced in squares and rectangles. These circular luxuries became trademark products for Roger & Gallet, and the company still takes pride in the quality of its soap. According to the website, the soap’s vegetal base is manufactured by a “traditional cauldron method” and is “core-fragranced” with essential oils. Each finished soap looks like a gift, wrapped in pleated paper and sealed with a decorative paper ring bearing the company seal, which almost seems a shame to open. However, the Carnation soap itself is worth breaking that banded seal to use. It satisfies expectations on all counts: a thick, smooth lather, a long lifespan, and a strong, durable fragrance. Each heavy, three-and-a-half ounce bar is saturated with the scent of the spicy, fringe-petaled carnation, emphasizing the peppery side of the flower’s personality. This soap would be a suitable companion product to any high-quality carnation perfume, although it bears more resemblance to bolder fragrances such Lorenzo Villoresi Garofano (or even JAR Golconda, if you’re fortunate enough to own the latter) rather than the ladylike Bellodgia or the flirtatious, creamy Malmaison. I’ve just realized that Roger & Gallet’s Carnation soap is a complete contrast to the natural, minimalist COPA Soaps that I reviewed a few weeks ago: it is richly perfumed, elaborately packaged, and steeped in tradition. I appreciate both approaches, when they are executed so well. Roger & Gallet Carnation soap sells for approximately $7.00 for a single bar in a travel case or $16 for a coffret of three bars. For buying information, see the listing for Roger & Gallet under Perfume Houses. This is an absolutely gorgeous carnation, wonderfully rich, spicy and peppery, not at all too sweet. Sadly, Roger & Gallet isn't distributed in Sweden anymore, so these babies have become harder to come by, but this used to be my favourite scented soap. I wish this carnation was available as a cologne. Oh, I love this one! 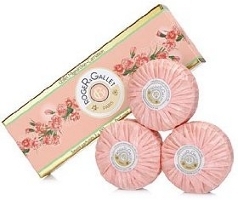 I am also a huge fan of carnation (probably my favorite floral note next to iris) And I adore Roger & Gallet's soaps, which are incredibly well-made & long-lasting. I also highly recommend their Wild Fern and Extra-Vielle scents. Thanks for the review of a personal fave! Carnation is not my favourite note so… but I have used Roger & Gallet Tea Rose soaps before and they were wonderful. I also remember their Sandalwood as being gorgeous. They're very good quality too. I'm sorry you can't find them too easily! I've been happily surprised to spot R & G products everywhere from fancy Upper East Side pharmacies to overstock stores like Cosmetics Warehouse in NYC, and all around the internet as well. Kiki, I didn't even realize there was a Fern scent. I'll have to keep exploring R & G. Thanks! I agree with you and Kiki: the quality of these soaps is excellent. They're old fashioned in so many *good* ways. Now I'll need to try more scents! I used to love this soap! Thank you for reminding me of it. I first found it in France and treasured the round, pink plastic box it came in for a long time. I even asked at the local essential oil shop for bath oil made a mix of carnation with a touch of clove so it would go with my soap. I'll have to find a bar of it soon. Thanks! I too have found R&G soaps in all sorts of odd places, like the tiny corner grocery (in a bin by the cleaning supplies.) Also at the hardware store. Weird. Anyway, Carnation is probably my favorite, but they're all nice — I tend to buy handfuls of the little ones to scent the bathroom. Definitely worth unwrapping, as you said! I'm saving the plastic container, too. It looks useful for carrying soap when actually traveling, or else just for storing a few perfume samples! Yes! You never know where they're going to appear. And I can hoard products for months on end, just admiring them and sniffing them from time to time, but I'm glad I finally opened this one and *used* it. Well, you know where I've been browsing and shopping. I will definitely follow your Gingembre recommendation. I should try giving these soaps as gifts, too. The packaging is definitely elegant enough! Oooh the vetiver is lovely! I haven't bought any for myself, but I enjoyed inhaling them in the department store. So clean smelling! Cheez, I'm not even usually a vetiver person, but I'm so impressed by R&G that I may have to sniff it myself. Thanks! These soaps are only carried at the only independent drugstore in my town. The only one, by the way, that dispenses Oxycontin prescriptions without snotty attitude (causing me not to have a Julianne Moore in “Magnolia” moment, for which I am grateful!) They also carry some of the R and G colognes; I purchased “Lotus Bleu,” which I love. I'll have to try the soap! My Mom discovered this soap when she was in her 20’s while living in Germany. I was brought up only getting to use this soap on special occasions (hard to find back in the day). I absolutely love this soap. I put unopened bars in the drawers of my dresser and the scent clings to my clothes just enough to make putting on even a tatered old t-shirt feel sexier. I buy them online and if I see them in a store I feel as if I have found gold because the carnation is rare or much desired by others too. Glad to see others love it too.